your designs. Not all are shown. New Years and creative projects all through the year. 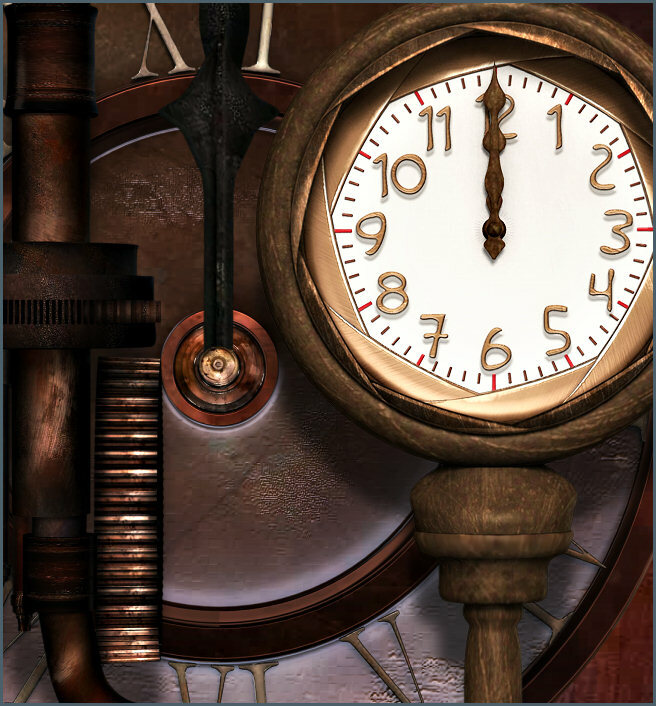 Steam Punk graphics for the year ahead. 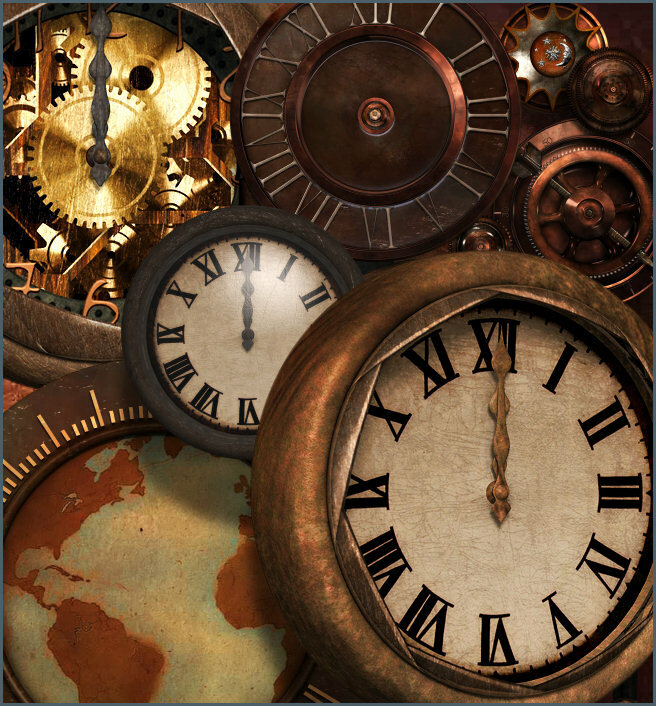 Charge up your designs with some zany Steampunk mechanical clocks. These will be great for New Year designs with a different flavor and will be useful all through the year for various historical, sci-fi, and fantasy designs. Steampunk is a subgenre of science fiction and fantasy literature and art that commonly features some aspect of steam-powered or highly mechanical machinery typically featured in an altered-reality setting. Such technology may include fictional machines like those found in the works of H. G. Wells and Jules Verne, but I will always fondly relate Steampunk to the American Old West, a time when machines and the rapidly growing technology were highly tinkered with. Steampunk also refers to an artistic style of clothing fashions, or subcultures, that have developed from the aesthetics of steampunk fiction, Victorian-era fiction, art nouveau design, and films from the mid-20th century. The style is highly recognizable and popular today. 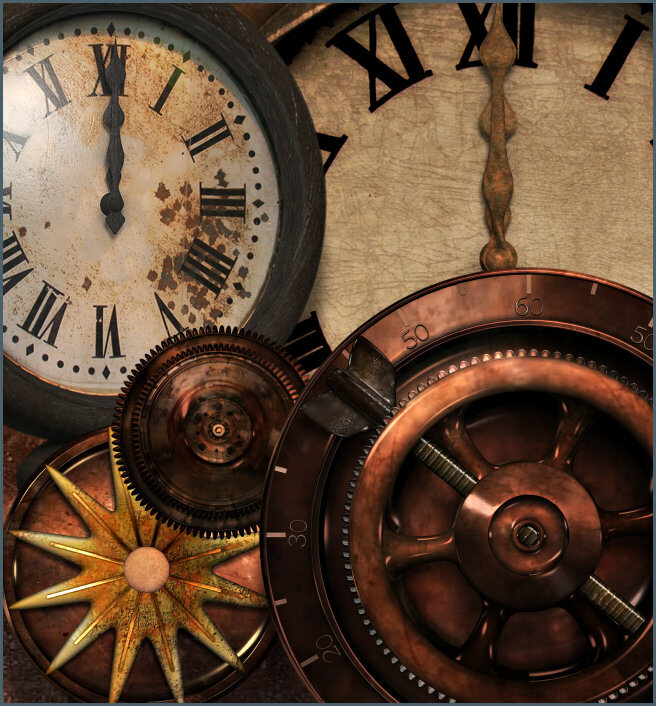 These clocks and mechanical parts will certainly lend that unique pseudo-Victorian, sci-fi, mechanical flair to your designs. Several clocks, clock stands, and various mechanical parts–gears, rivets, etc., are included in this package. Two variations of the seamless background tile on this page are also included in this package. The size of these images varies, but they are approximately1000 X 1800 pixels. All are 300 DPI, making them great for print projects. This package is one zip file, which is approximately 46.5 MB.